Mattie does not like his curly tail and tries everything he can to make it straight. It's curliness is part of who he is but it makes him sad and he'd rather not be so unique. His friends though have a plan, to remind Mattie why he is exactly perfect the way he is. 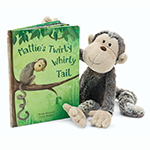 Included in the set is Mattie Monkey plushie. Did you see someone grinning in that tree? Yes, it’s magnificent Mattie Monkey! What fantastic fur he’s got, with silvery patches and heathery spots. Big peach feet and friendly hands all help him climb and jump and land, while great big smiles and long, soft limbs mean we all want to be friends with him!